"That afternoon, for instance, I was wearing a man's paisley vest I'd found at a yard sale, over a striped button-down shirt with tuxedo-stripe black Spandex stirrup pants, held up with pink-flecked black suspenders. My hair was pulled straight back with a paisley comb, and I was wearing electric-pink ankle boots. The boots really set off the formality of the rest of the outfit, sort of like the punchline of a joke. I think you can tell a lot about people from the way they dress. If you saw me, you might think: artistic, fun-loving, good sense of humor. At least I hope you'd think that." Claudia considers black Spandex stirrup pants formal wear. Also, Claudia and Stacey both really, really, really love ankle boots. I'd just like to establish that here and now. "Claud is artistic, ultra-trendy, and gorgeous. She's Japanese-American and has these beautiful almond-shaped eyes and shiny black hair that is soooooo long and straight. She wears it a million different ways: a French braid down her back, double and triple French braids with sparkly ribbons woven into them, or sometimes just pulled up on one side with a wide barrette that she made herself. She makes her own jewelry out of clay or papier-mache. Sometimes she'll wear a pink flamingo in one ear and a palm tree in the other, and then put a tiny gold monkey on top of the palm tree. (She has two holes pierced in one ear.) Claudia can wear anything and it looks great. Like she'll wear polka dot leggings with a short red skirt. Then she'll wear a long-sleeved t-shirt with a black vest (covered with cool pins that she's made herself) over that. Sometimes she decides to go fifties and wears penny loafers with white anklets." Later on, while Jessi is baby-sitting for Claire and Margo Pike (you remember them, don't you, silly-billy-goo-goo? ), the girls are playing with some vintage dresses from their dress-up trunk, and Margo finds a blue chiffon dress that "looked like a prom dress from the nineteen fifties. Jessi [thinks] for half a second that Claud might really like it, too. Claudia is very into fifties styles." Rad! Can you guess what her earrings were? Dangling watermelon slices. Get it? She was dressed like a watermelon, head to toe. And, of course, Jamie loves the effect." oh yeah, I'm going there. It's mystery time. "Janine sometimes teases me and tells me I'm 'shallow' because I'm interested in hairstyles and cool clothes. I'll admit that I love to wear trendy stuff - in fact, sometimes I'm the one to invent trends in my school. And I do love to try all kinds of wild things with my hair, which is long and black and straight. I even love to experiment with makeup. I like to try accentuating certain features. But I don't think that makes me shallow. These things are part of my artistic nature. I see my body as a blank canvas, and I can put anything I want onto that canvas, depending on my mood. Does that make any sense? I was thinking this over, and checking that day's outfit (lace leggings, purple tie-dyed T-shirt dress, and purple high-tops) in the mirror, when I was snapped back to reality by Charlotte who was tugging on my sleeve." I like that Claudia is so distracted by her own fashion greatness that she's ignoring the kid she's sitting for. "Sometimes I wish I were the kind of person who thinks ahead about what I'm going to wear to school each day. Like Mary Anne. I happen to know that she lays out a whole outfit - from headband to shoes - each before she goes to sleep. She is so organized. But sometimes I'm glad I'm a disorganized slob at heart. I think the outfits I put together spontaneously are much more creative and fun than they would be if I planned each detail ahead of time. For instance, as soon as I looked in my closet that morning, I knew I wanted to wear this pair of black-and-white-checked stretch pants I just bought. I grabbed them and pulled them on. Next I started to look around for my red belt, since it would look perfect with the black and white. 'I know it's here somewhere,' I muttered as I poked around in my closet. Then I remembered: I'd been using the belt to hold my portfolio shut. The portfolio clasp was broken, but the belt held it together just fine. I found the portfolio under the bed and unbuckled the belt. I reminded myself to ask Mom for something to take the belt's place. Next I needed a blouse. I figured a black one or a white one would look fine, so I knew I'd have no problem finding something. But I was wrong. Believe it or not, every one of my black blouse and every one of my white blouses was in the dirty laundry. Or crumpled at the bottom of my closet, which was basically the same thing. I shrugged. Okay, I thought, no problem. I remembered that fashion magazines always say to be bold and mix your patterns. That's what I'd do! I checked the closet again and found a black shirt with white polka dots. I held it up and looked in the mirror. The dots next to the checks made me a little dizzy, but I decided that the total effect was just what I had been looking for. I pulled on my red ankle boots, put my hair into a ponytail on the side of my head (fastened with a black-and-white barrette), stuck on my favorite red heart-shaped earrings, and I was ready to go. All in under a half an hour. That's how I get dressed almost every morning. I'm sure watching me do that would drive someone like Mary Anne nuts, but personally I think it's a lot of fun. It's always a challenge to come up with a super-cool outfit on the spur of the moment." Notice the extraneous belt (since she's wearing stretch pants) . . . once again, Claudia knows about 2007 hip-kid fashion. She just feels it in her 'creative' spelling, candy eating, disorganized slob heart. I want candy. the mystery is why someone would cheat off Claud in the first place, if you ask me, but Ann M. Martin cleverly covers herself by adding that said cheater overheard Claud talking about studying with Janine, that genius sister of hers. 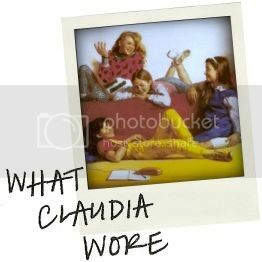 This book was always a real favorite of mine back in the day, possibly because it was full of Claudia fashion wisdom. "Anyway, I love to dress in a way that some people here in Stoneybrook might call outrageous. For example, here's what I was thinking of wearing the next day: Since I had the big test, I thought I'd start with my lucky earrings - the ones that look like Princess Di's. They're huge (pretend) emeralds, surrounded by thousands of tiny (phony) diamonds. Then I thought I'd work downward from there, wearing my new green-and-blue-tie-dyed T-shirt dress (the casualness of the dress would be an interesting contrast to those fancy earrings) over green leggings. The only thing I hadn't figured out was the shoes should I go with my old ballet flats, or the black leather high-tops I'd just gotten? I was having a hard time deciding." I closed my eyes and tried to concentrate. But no matter how hard I tried, I couldn't remember a thing about that day. (Except for what I wore. I can always remember what I was wearing on a given day. I had decided on the ballet flats, in case you were wondering.)" "I woke up early and lay in bed thinking about what to wear to school. What outfit could I wear to best express my new attitude? I decided that somebody who felt the way I did (or at least the way I wanted to feel) would dress pretty wildly. I decided to do a Ms. Frizzle. Do you know who Ms. Frizzle is? She's a character in this great kids' series - the Magic School Bus books. Ms. Frizzle is a wacky teacher who takes her class on amazing class trips - like, would you believe, inside the human body! Anyway, you must be wondering what this has to do with what I was going to wear. Well, here's the thing. Ms. Frizzle is the wildest dresser I have ever seen! She always wears these coordinated outfits. In Inside the Human Body, she wears a dress with eyes and ears and noses all over it. And her shoes have - you guess it - tongues! In another book, she wears a dress with a caterpillar design - and on her shoes are butterflies instead of bows. I love the way Ms. Frizzle dresses. I decided that my theme for the day would be The Sea. I put on a blue skirt with brightly colored tropical fish printed all over it. Then I put on a green blouse. I figured that could represent seaweed or something. I pulled my hair into a ponytail, over to one side, and I pined it with a sand-dollar barrette I made last summer. I ran to my closet and pulled out a pair of shoes. They're the plastic kind called 'jellies' that I had decorated with stickers of seahorses and shells. I looked at myself in the mirror as I slid the shoes on. Was it too much? I shook my head. I looked great. I looked like someone who didn't care about what grade she got on a dumb old math test."